Name the Temple Cow Contest - Vote Here! ~ The Toronto Hare Krishna Temple! Name the Temple Cow Contest - Vote Here! "Name the Temple Cow Contest"
One of the key elements of our philosophy as Hare Krishnas is the care, protection and worship of the cow. Last year, during Janmastami celebrations, small wooden cows were sponsored by devotees and the temple indicated that part of the proceeds from the donations for those small cows were going to be put towards cow protection. 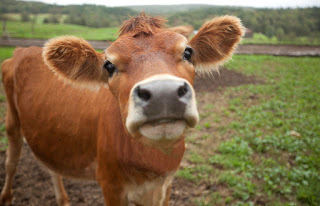 Now, a year later, we are excited to announce that the temple will be saving a cow which will be rescued from slaughter. This cow will then be brought to Govardhana Farms where she will be cared for until the end of her natural life, never to be slaughtered. Under the protection of the soon-to-be-charitable organization, ISKCON Govinda’s Herd (part of Govardhana Farms), this cow will have sufficient grazing grounds, shelter, food, medical care and lots of love. However, there is one thing that she is missing and that is a name! We are therefore proud to launch the “Name the Temple Cow Contest”. Up until November 8th, 2015, devotees will all have the opportunity to participate in the process of giving the temple cow her very special name. The name of the cow will be revealed during the Sunday Feast on November 8, 2015. A ballot box will be placed at the ISKCON Toronto reception desk. Printed cards with five different name options will be provided. All you have to do is fill out the ballet by choosing one of the names as your favorite and placing it in the box. You can also vote online by using the form at the bottom of this post! When and Where will the Temple Cow’s Name be Revealed? The grand festival will occur at the ISKCON Toronto temple during the November 8th Sunday feast from 6pm to 8:30pm. Everyone! Please note, the online votes below will be added to the votes submitted in person at the Temple Reception Desk.